Announcement: The Lerdge TMC2100 driver has been discontinued and can be replaced by the TMC2208 driver. The TMC2208 is equivalent to the upgraded version of the TMC2100. Compared to the TMC2100, TMC2208 driver module generates less heat, and the drive current is increased. 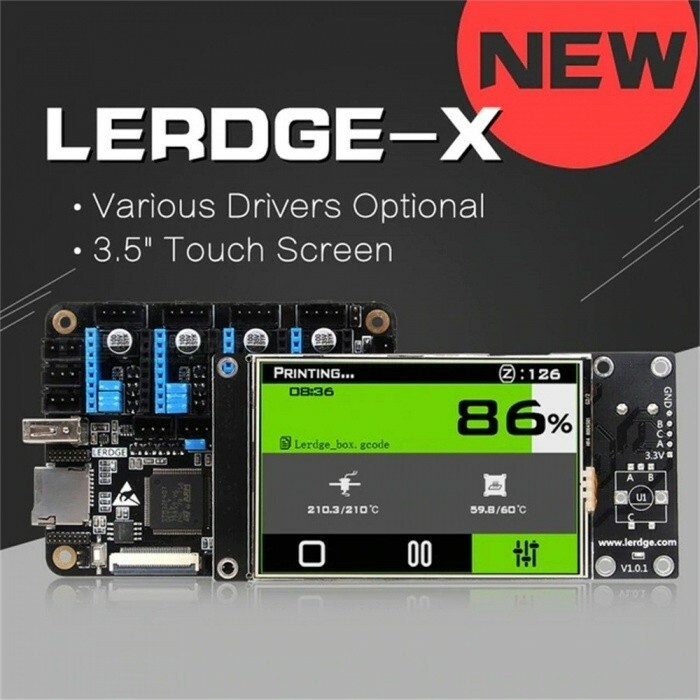 Among Lerdge 3D Printer boards, Lerdge-X is a highly integrated control board designed for the Small 3D Printers, Educational 3D Printers and Entry-level 3D Printers. 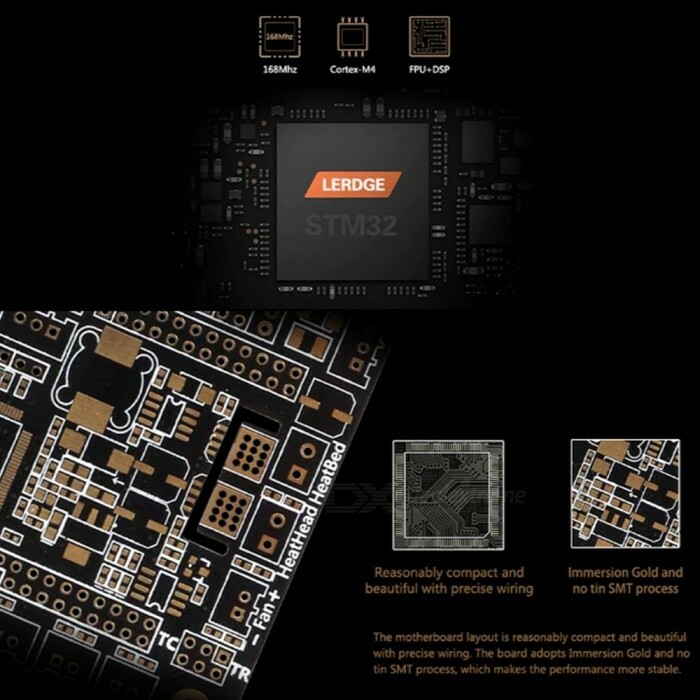 The mainboard uses a 32-bit coretx-M4 Core control unit, strong and stable performance, feature-rich, price concessions. With 3.5-inch full-color IPS LCD touch screen, it brings the simple and smooth operation. The motherboard uses an open interface, are free to match different motor drive modules (A4988, DRV88225, LV8729, TMC2100 and external driver, etc.) to meet different customer needs. Motherboard optimizes limit switch connection, and with a comprehensive line protection design. Motherboard (drivers optional), 3.5-inch display, 20cm FCC display cable, 30cm FCC display cable, 30cm power cable, resistance touch pen, nylon material screw nut 1 set, flat screwdriver 1pcs. About the power continued to play function: Lerdge-X motherboard comes with print pause, print save, boot continue to print function. For accidental power outage, power failure to save continued playing, shut down after printing finished functions, the additional power monitoring module is required. 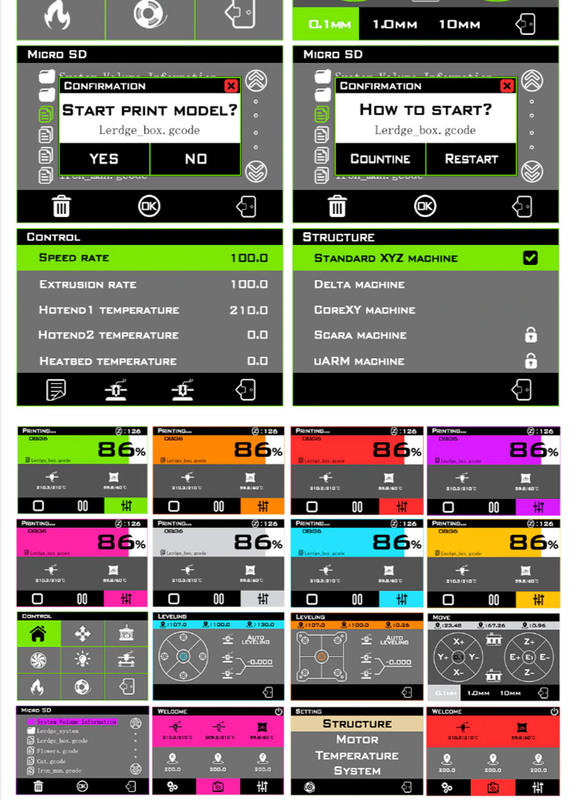 About printing: Lerdge-X motherboard supports off-line printing by default (TF card printing or U disk printing). If you need online printing, an online module is needed. 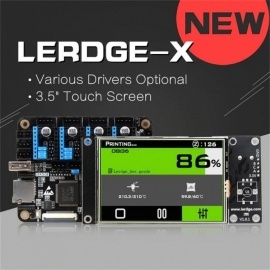 — Lerdge-X motherboard U disk printing supports USB2.0 and USB3.0. 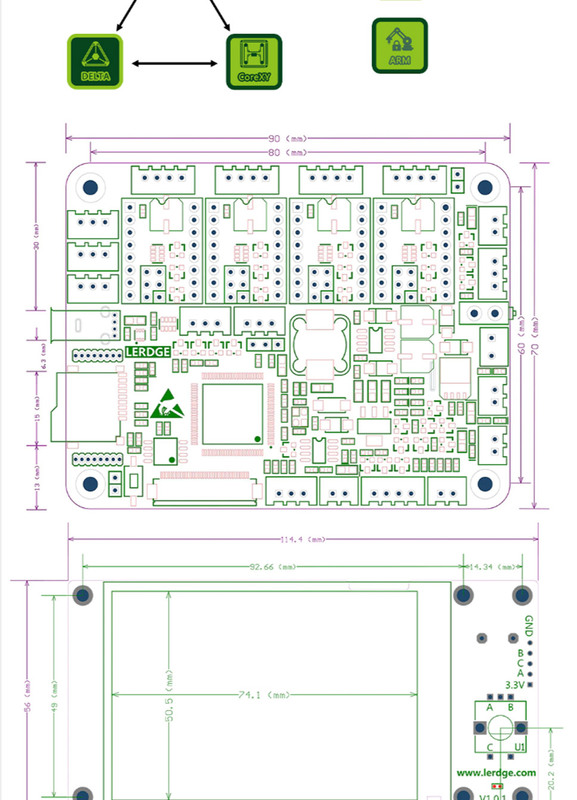 About heated bed: If want to use Lerdge-X motherboard with heated bed, the heated bed adapter module and high-power hot bed module are required. 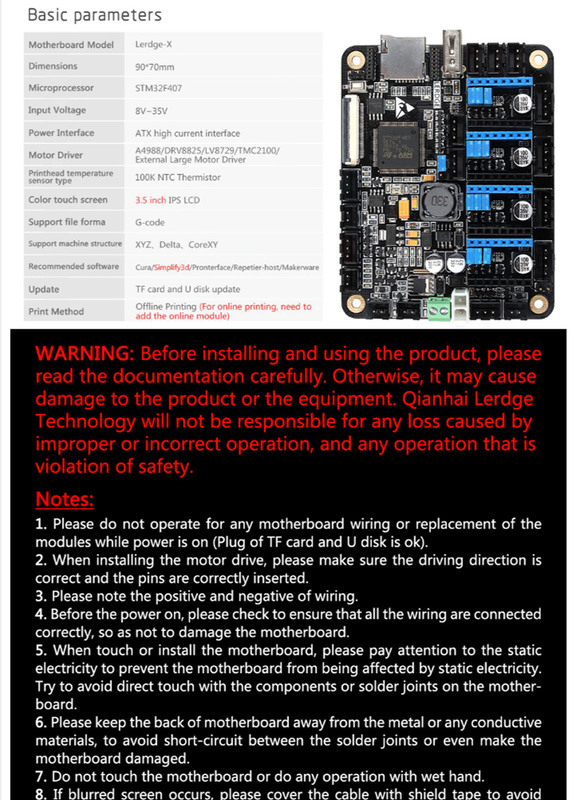 Buying advice: It is recommended that the motherboard is equipped with Lerdge drivers. 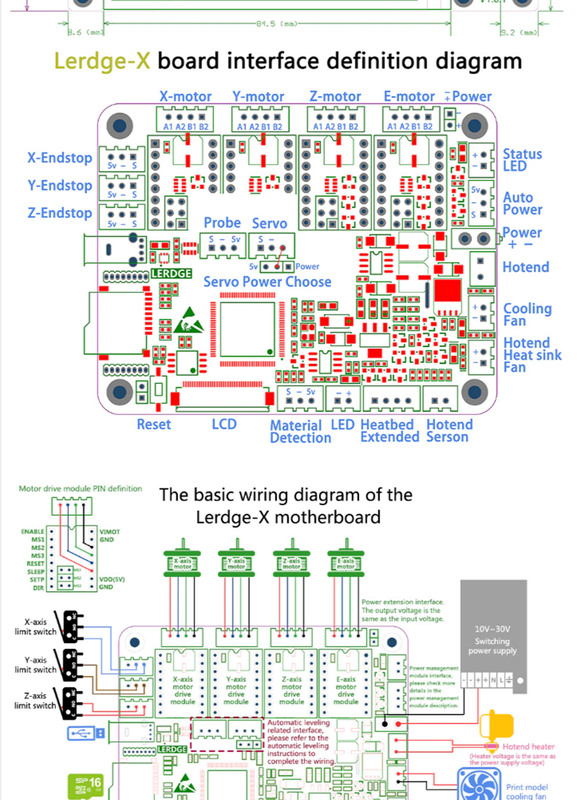 The Lerdge motherboard currently supports A4988, DRV8825, LV8729, TMC2100, external large motor adapter and TMC2208 (other drivers not tested yet, not suggested to use). In addition, the length of the touch screen cable is recommended not to be longer than 70cm, otherwise it may cause the touch screen display interference. Software: S motherboard and X motherboard are based on the same set of software development, with the same software maturity. 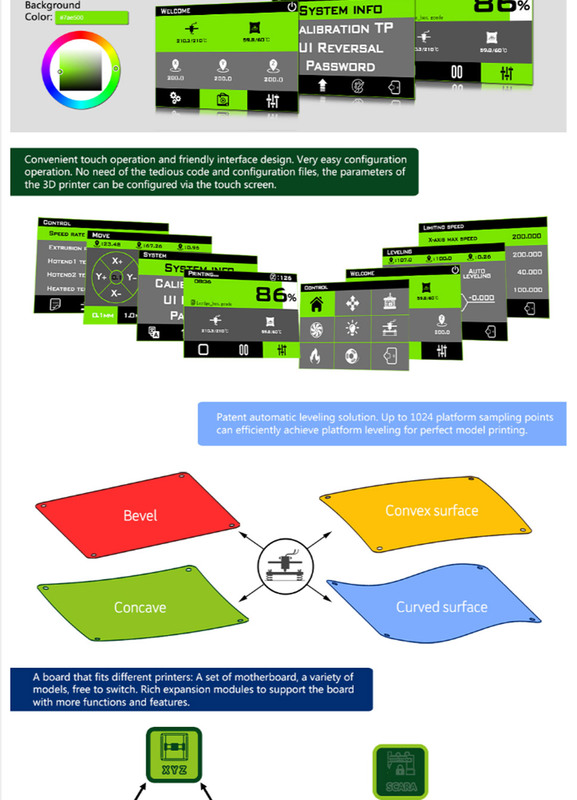 As the basis entry-level motherboard, X board only contains the most basic 3D printing capabilities, no more expansion. 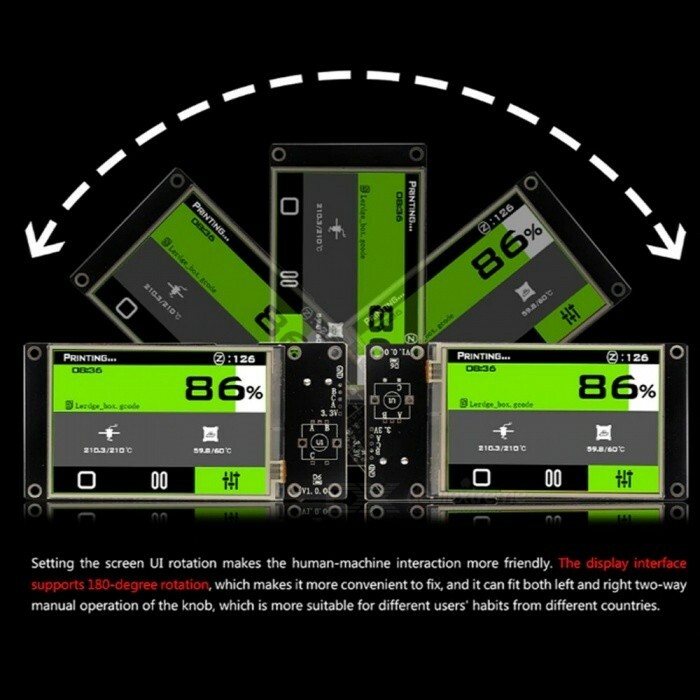 Compared with S-board, the X-board is with less expansion function in software. Hardware: X-board chipset configuration is slightly lower than that of the S-board, but they are with the same frequency of operation. 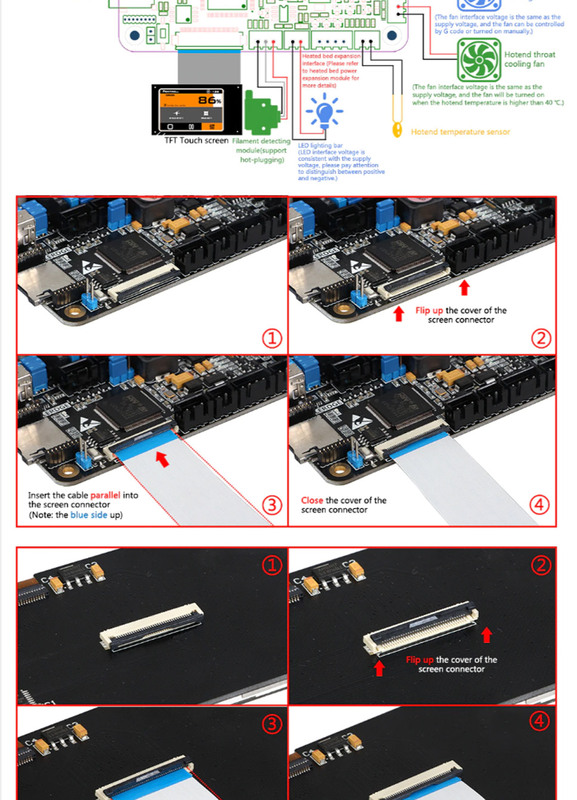 X-board can not support color LED function( but supports single color strips). X-board only supports single print head, and an external expansion module is needed for the use of hotbed.